Virtual reality isn't just expensive to produce, it's completely overturned traditional methods of storytelling on film. Here Aardman explains how it's rethinking narrative when the viewer is in control. Late last year, Aardman partnered with Google on its Spotlight Stories, a way for Google to showcase the creative possibilities of 360-degree video. 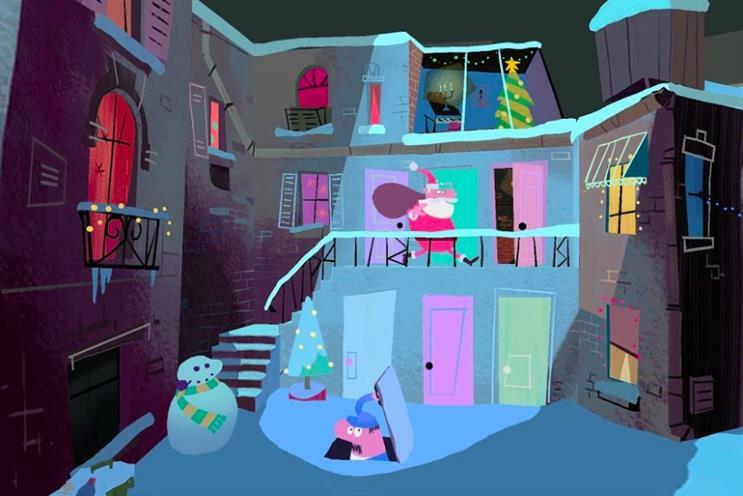 Aardman’s Christmas short, ‘Special Delivery’, was a simple caper about Santa trying to deliver presents to a block of flats while dodging the janitor. Anyone with a Google Cardboard headset, the Google Spotlight Stories app and a compatible phone could watch the four-minute film. But unlike a normal film, the viewer is in control. They can watch Santa on his present delivery mission, the janitor chasing him around various buildings, or even watch one of the sub-plots unfolding in the block of flats. For Aardman, ceding control to the viewer meant rethinking storytelling from the ground up. "We’re very used to making content as engaging as possible for [when we] are in control," says Heather Wright, head of partner content at Aardman. "But in Special Delivery, the viewer was the camera. The key thing was pacing and timing, especially in comedy, that’s important for making it funny. We had to find a way to make characters engaging enough for people to want to stay with a character and follow their journey through." In Special Delivery, the viewer is presented with multiple choices, a key differentiator from normal storytelling. This is both challenging for the viewer – who doesn’t want to miss out on the best plot – and the director, who has to ensure the viewer doesn’t lose the main thrust of the narrative. Although VR and 360-degree video are often compared to gaming, it isn’t the same, says Wright. In a game, the viewer is the protagonist who drives the action. In VR, they are more like the camera. Yielding control is scary, whether for a director or a brand. But one interesting nugget is that virtual reality films stand up to immediate repeat viewings. Audiences who may have missed out on sub-plots or small details will be keen to rewatch content. How many times is an audience likely to view a traditional ad twice in a row? Aside from having to come up with multiple, compelling storylines, Aardman had to rethink how it tells jokes and how it creates scenery when the viewer’s in control. One learning was that the comedy couldn't be nuanced, because it needed to grab the viewer’s attention. In Special Delivery, says Wright, the comedy had to be "slapstick". "A more intimate gag is much harder to do in that environment," she says. Another aspect to consider is the fact the screen is, quite literally, in the viewer’s face. That means the physical detail of a story and scene has to stand up to close scrutiny, something Aardman’s digital group creative director, Dan Efergan describes as "story density". "There’s a minimum amount of visual action you need to get across for emotion, or feeling," he says. "Because it’s spread through this wider environment, you need to add more density." This might be challenging for conventional film makers, but Aardman, with its love of in-jokes and additional references, found this came quite easily. In Special Delivery, for example, Aardman added depth to the janitor’s backstory. Although the conventional ‘baddie’ of the film, he also appears to live alone in his office, underground, with no interaction with other characters. Wright believes the storytelling will become more sophisticated, particularly with interactive virtual reality, where viewers can physically move through a space. "The viewer will need to be able to move around within the space, rather than being stuck in one space," she says. "In a gaming environment, though the viewer stays still, the environment moves around you, so you can go to different worlds." One of the problems this raises is the sheer amount of scenery that needs to be programmed around a moving viewer. And unlike a game, a viewer needs to have a strong narrative reason to move. Rather than thinking of the narrative as having a neat beginning, middle and end, individual scenes become much more important. "We started thinking moment by moment," says Efergan. "During a moment, what is it you need to deliver? What point can you move [the viewer] along?" During an upcoming virtual reality project with the BBC, Aardman found it began using theatrical storytelling techniques – relying on buildings and scenery to help tell the story. "If you were standing, as the audience, on a corner, you might look left and see the bad guys running away," says Efergan. "If you looked to your right, you would see the good guys coming, and you know they will meet. "That’s quite physical, architecturally-based storytelling." A VR film also doesn’t allow for close-ups, because the viewer is in control of the camera, so a character’s thoughts and feelings need to be conveyed differently. "The set becomes much more critical," says Wright. "You can’t cut to a drop of sweat to get sub-text. Whatever you’re doing, you have to do across a physical distance. If the character is too close to the viewer, it feels awkward," adds Efergan. Aardman’s experimental project with the BBC is exploring the future of storytelling, and examines the emotional ‘depth of view’ within virtual reality. For example, the two are examining how eye contact with a character might alter a viewer’s feelings towards the narrative. The project will be Oculus Rift-only, and will tell the story of Syrian refugees’ journey between Turkey and Greece. Aardman had access to BBC news correspondents for the story, and the film will go live on the BBC’s experimental platform, BBC Taster, some time in May. "It isn’t very Aardman at first glance. It isn’t humour and comedy, but it gave us a really interesting place to deal with emotion," says Efergan of the project. Aardman describes itself as "agnostic" towards different virtual reality tech, with HTC’s Vive, the Oculus Rift, Microsoft’s HoloLens and Sony’s PlayStation VR all vying to attract buyers. "For us, it’s about where we can get the biggest audience numbers for standardisation, and for the tech to become affordable," says Wright. "We haven’t used the same bit of tech twice on this." Efergan adds: "There’s a vast difference from the top-end to the bottom. The HTC Vive has an amazing sense of presence, but you’re building for 15 people. And if you set up a Vive, it’s one-and-a-half hours before you can even get to an experience." It’s too early, he adds, to see whether virtual reality will peak and collapse at the ‘inflated expectations’ curve of Gartner’s hype cycle. But either way, it won’t drastically change the way Aardman does business. "We don’t see it as a threat," says Wright. "Our whole purpose is to entertain and acquire audiences – and as long as the audience is there, we’ll be there."